New York has a way of producing dyed-in-the-wool jazz artists, many of whom achieve recognition for prodigious talent at a very young age. Thelonious Monk, whose widespread recognition in the jazz press came only after considerable time, was nevertheless understood as a special musical talent by the time he was accepted at Stuyvesant High School, a magnet school in the New York City school system. 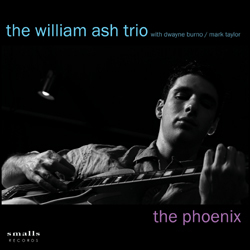 Many artists on Smalls Records, such as John Mosca, Chris Byars, Ari Roland, Sacha Perry (all of whom can be heard on Across 7 Street / Made in New York / Smalls Records SRCD-0002), and here William Ash, came by a similar route, and most were already known around the New York scene by age thirteen. On his own instrument, William acknowledges Wes Montgomery as a major influence, and William has been selected several times to appear in tributes to Montgomery. William’s style emerges from his experiences playing with the great bop masters, as well as from playing in hard-driving organ combos with the likes of John Patton and Bobby Forrester, and you can clearly hear how he combines twisting bop melodies with deep groove. At Smalls, Wiliam was featured weekly for much of the last six years of the club’s existence. [The club has since graduated to a larger space at 75 Christopher Street under the name Fat Cat.] On his weekly trio engagements, William brought in a who’s who of bassists and drummers, including Gerald Canon, Dwayne Burno, Dennis Irwin, Paul Gill, Willie Jones III, Mark Taylor, Jimmy Cobb, and Bobby Durham. Also, William was a regular in Frank Hewitt’s legendary Saturday night quintet, along with Chris Byars, Ari Roland, and Jimmy Lovelace. This group exemplified the spirit of the Smalls scene, playing to a packed house every week beginning at three o’clock in the morning, and often going past five. The release of this recording signals William’s debut as a leader on an American jazz label. [He’s already quite well known in Japan, and travels there regularly to tour.] We’re fortunate to have him here with regular associates Dwayne Burno and Mark Taylor, and in the company of a working group, the groove is that much deeper. It is hard to say enough good things about Dwayne Burno. A brilliant and soulful player with endless drive, Dwayne lays down lines that are right in the pocket, and really, really move. Somehow Burno is always one or two steps ahead of the listener, and one has to marvel at his quick-witted inventions. No wonder he’s been a favorite of such greats as Freddie Hubbard, the late Joe Henderson, Cedar Walton, Roy Hargrove, Roy Haynes, Benny Golson, and many others. Mark Taylor is a first-call drummer, known for his work with Johnny Griffin, Lew Tabackin, Monty Alexander, Mose Allison, George Coleman, James Moody, Art Farmer, and Clifford Jordan. Few drummers have the combination of power and precision that Taylor has, and his accompaniment here is always tasteful and never excessive. He and Burno meet up perfectly on this date. The bass-drum hits that William is fond of employing in his compositions are performed impeccably. This was an especially spirited session from beginning to end, featuring mainly an array of Ash’s original compositions. The groove is funky, and to complement that, we fashioned the sound somewhat after the warm sound of a Rock-Ola jukebox playing your favorite 45s, with bigger-than-life bass and reverb. There are musical highlights throughout. Lee Morgan’s “The Sidewinder” gets the kind of Boogaloo feel that the tune was meant to have, and that few others get right. Bird’s venerable “Constellation” is taken way up, in tribute to C Sharpe, who used that tune traditionally and in many variations as a theme-out at the end of each set. William’s “Crystal Bird,” propelled by the pitter-patter of Taylor’s drumming, quickly joined my list of all-time favorite tunes to listen to on a rainy day. Come to think of it, all the tunes served up here are similarly tasty.